The focus of this week's Vet Gazette Faculty Spotlight is Dr. Stacy Tinkler, who has been promoted to clinical associate professor of equine community practice in the Department of Veterinary Clinical Sciences. She is one of ten PVM faculty members recognized at the College's annual Promotions Reception last month. 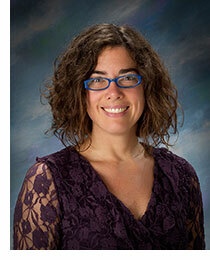 Dr. Tinkler earned her DVM degree from the University of Minnesota College of Veterinary Medicine in 2005. After graduation, she completed an internship at an equine hospital in Phoenix, Ariz., and a year later returned to the University of Minnesota to assist with their new equine ambulatory service. Dr. Tinkler then transitioned to a large animal internal medicine residency, which she completed in 2010. She became a Diplomate of the American College of Veterinary Internal Medicine (large animal internal medicine) in 2011. Since coming to the Purdue, Dr. Tinkler has worn many hats, starting as a research fellow and visiting clinician of large animal internal medicine. She officially joined the PVM faculty in 2011 when she accepted a joint appointment involving Equine Community Practice and a tutoring position in the applications and integrations (A&I) case-based learning courses. When asked what attracted her to a career in veterinary medicine, more specifically equine medicine, Dr. Tinkler said, "My parents put me on a pony when I was two-years-old and couldn't keep me away from animals, especially horses, after that. Going to veterinary school was part of the natural evolution of that love for animals, but I discovered other things along the way, such as a love for teaching." Dr. Tinkler's passion for the profession helps inspire PVM students and colleagues each day. Caring for animals in Third World countries also has played a significant role in Dr. Tinkler's career. "I have a particular passion for international veterinary medicine, more specifically treating working equids in the developing world," Dr. Tinkler said. "Additionally, I enjoy training veterinary students in both the developed and the developing world to provide veterinary care to these animals and to open their eyes to the important issues facing working animals and the people in their communities in developing countries." A lover of exploration, Dr. Tinkler also said travel is one of her favorite hobbies. "Any time I can go explore a new place, new people, or new culture, I am happy!" Her advice for those looking to pursue a veterinary medicine career? "You never really know which paths you will find yourself on in life, and interesting opportunities present themselves when and where you least expect them to – if you aren't open to them you will miss them." Congratulations to Dr. Stacy Tinkler, the focus of this week's Faculty Spotlight, as one of ten promoted PVM faculty this year!